Thomas Henry’s parents, Thomas Hickman from Henley and Margaret Crowley from Brentford, married in the Brentford district in 1890. In the 1891 census, the newly-weds were living at 3 Moors Alley in Ealing. Thomas worked for the Thames Conservancy which was responsible for the management of the river. Their first two children, Thomas Henry and Annie Mary were born in Chiswick in 1891 and 1894. 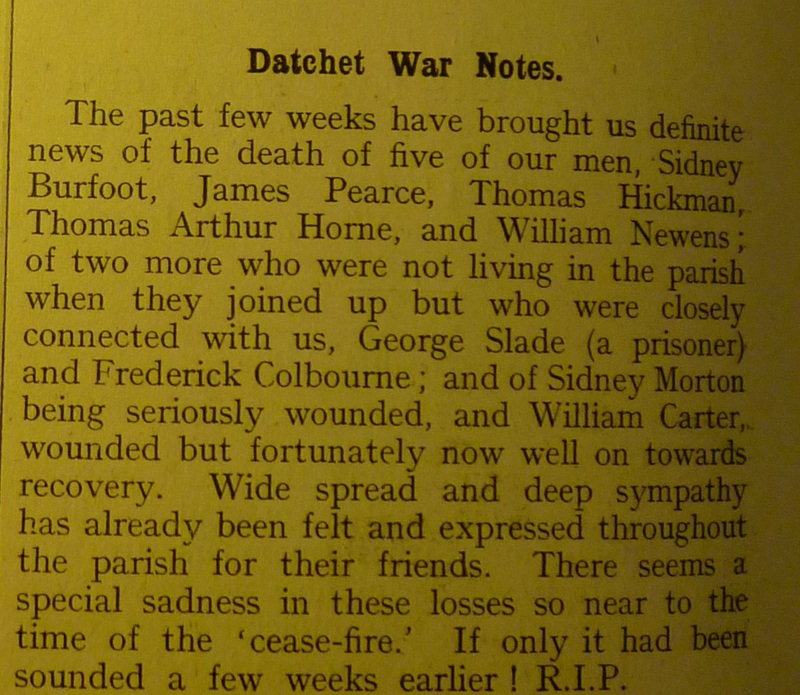 By the time of the 1901 census, the young family had moved to Datchet and were living in Horton Road, most probably at 3 Warwick Cottages. A third child, Margaret Julia, was born around 1904 in Datchet. In the 1911 census, the family was recorded living in four rooms at 3 Warwick Cottages. Father Thomas was away at work, as Master of Thames Conservancy Dredger number 4. His son, Thomas Henry, by then 19, was working as a jobbing gardener. Thomas Henry joined up soon after war broke out. He enlisted in Slough on 16 November 1914 as Private 9866 in the Oxfordshire and Buckinghamshire Light Infantry, (OBLI), although we haven’t yet discovered which battalion he served in. We’ve learned from newspaper reports that he entered the theatre of war in France on 26 January 1915 and was wounded there in May 1915. In September 1915 he was sent to Salonika and in 1917 he took part in the Palestine operations. In June 1918, he went back to France. It is around this time that we believe he was transferred, as Private 20181, to the 2nd Royal Munster Fusiliers (RMF). The 2nd Battalion RMF was in France for the duration of the war so Thomas Henry most probably served in Salonika with the OBLI. (The 7th and 8th Service Battalions OBLI, served in Salonika as part of the 26th Division which remained there until the end of the war.) We know Thomas returned to France in June 1918 which suggests he was transferred to the RMF around that time. According to the Long Long Trail website, the 2nd RMF was rebuilt in June 1918 following losses, and in July it transferred to the 150th Brigade in 50th (Northumbrian) Division which was also being rebuilt. The 50th had taken part in three great battles against the German offensives in the first half of 1918, had suffered heavy casualties and was exhausted. The original infantry units left and others arrived to take their place, including the 2nd RMF. It was not until October 1918 that the Division was once again considered to take the field. The Division was then engaged in the Battles of the Hindenburg Line from 12 September to 12 October 1918. 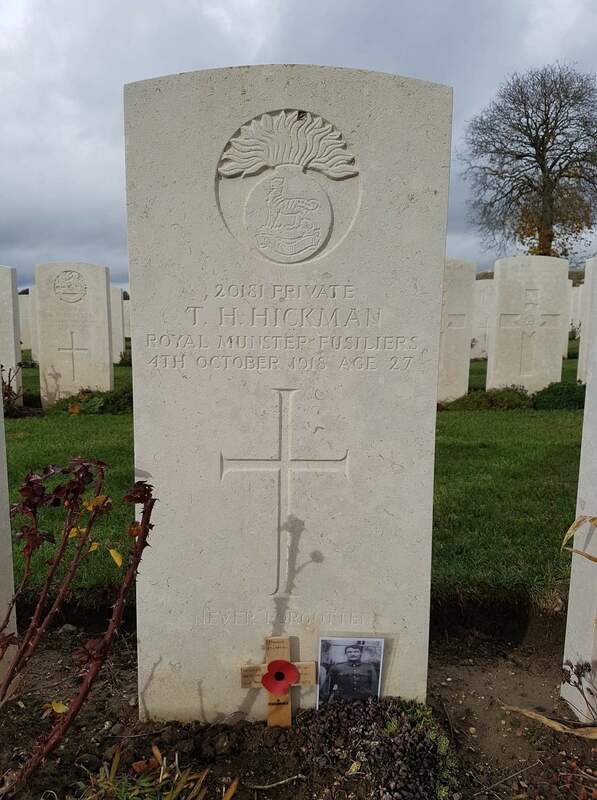 Having survived most of the war, Thomas Henry Hickman was killed in action on 4 October 1918, age 27, when the Division was fighting at Beaurevoir. Just over a month later, peace was declared. 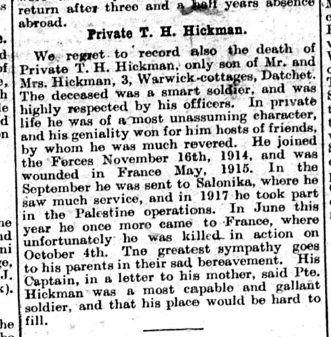 Private T H Hickman: We regret to record also the death of Private T H Hickman, only son of Mr and Mrs Hickman, 3 Warwick Cottages, Datchet. The deceased was a smart soldier and was highly respected by his officers. In private life he was a most unassuming character and his geniality won for him hosts of friends by whom he was much revered. He joined the Forces November 16th 1914 and was wounded in France May 1915. In the September he was sent to Salonika where he saw much service and in 1917 he took part in the Palestine operations. In June this year he once more came to France where unfortunately he was killed in action on October 4th. The greatest sympathy goes to his parents in their sad bereavement. His Captain, in a letter to his mother, said Private Hickman was a most capable and gallant soldier and that his place would be hard to fill. 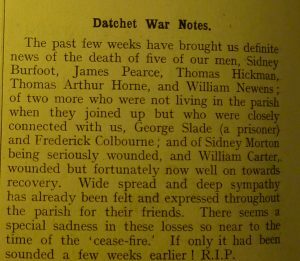 Datchet’s Parish Magazine also noted Thomas Henry’s death in December 1918, among a list of other men from the village who died so close to the end of the war. 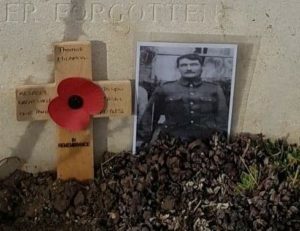 Thomas was first buried at Gouy British Cemetery (Aisne) in the hamlet of Rue-Neuve (or Rue-du-Moulin), on the road from Gouy to Estrees. 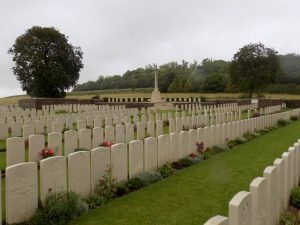 The cemetery, which stood in a paddock among pasture fields, close to a farmhouse, was made by the 50th Division in October 1918. It contained the graves of 127 British soldiers (almost all from the 50th Division) and one Australian, who died between 3-10 October 1918, except for one soldier who died on 18 October. Le Catelet and Gouy had been captured by the 50th Division on 3 October 1918. Thomas Henry Hickman was awarded the 15 Star, Victory and British War Medals, and is remembered on Datchet’s War Memorial on the village green.